Happy Tuesday loves! Our "April showers bring May flowers" apparently started early this year since we've had rain for the past 4 days in a row. It's supposed to only be partly cloudy today but I'm missing the sun so I'm hoping the rain is finally over. Speaking of rain, if you read my post yesterday you saw that Kerri, the boys and I all braved the elements and headed out to watch an Atlanta Braves spring training game over the weekend. The weather was all over the place that day. It started out cloudy and in the upper 60's (which is actually pretty cool out for us Floridians) but the high was supposed to be in the mid 80's so I was really torn on what to wear. I knew one thing was a necessity, my Reds baseball hat, but the rest of the outfit was pretty much up in the air. I know, I know. I hate being THAT person who wears the apparel of a team who isn't even playing at the game BUT I don't get to wear my Reds stuff often down here so I took advantage while I could. It was only a spring training game so it's not like it mattered, right? Ok, enough of that and back to the outfit! I think I changed outfits at least 3 times (including last minute in the car) and decided to go with my highwaisted shorts and a simple tank top. It ended up being so hot outside so it was my best choice. I can't even begin to tell you how uncomfortable it can be taking pictures in public so try to ignore the awkwardness of these and how incredibly bright it was outside! So cute! I cannot wait to break out the shorts this year. If it would only stay one temperature for awhile in Texas...Have a great week! I love your cute and casual look. You make me want to get those Converse sneaks so badly!! Glad you guys had a good time! This looks like a great outfit for a day in the heat. Hat is key! So fun that you went to a spring training game!! Your shorts look so comfy! And you're right. Taking pictures in public is soooo awkward! You know I've never been to a spring training game?! I think I'm going to have to get my act together next year and make it happen! Looks like a fun time! The perfect outfit for a game, hat and all! You look so cute and not awkward at all! 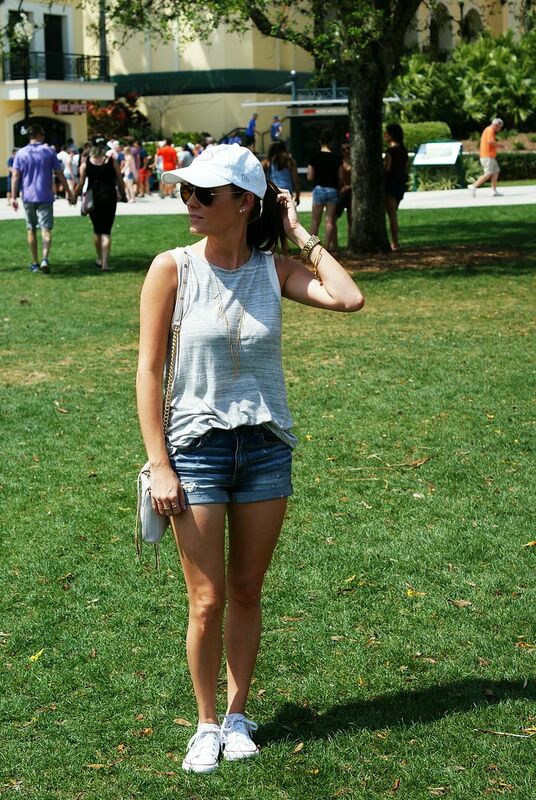 cute and casual, even in the dang heat!! go braves!! Girl, I wish you could come to a Reds game here in AZ! Their training field is just minutes from my phone! And we totally went to their game (against the Angels) decked out in red sox gear, HA! Saturday was so so so brutally hot out and I was wearing shorts as well and those hot seats.....can't even! Love that top on you though! You don't look awkward at all, lady! I get the feeling though, I often just say forget it when I'm in public because I get all weird. Love your outfit. Our weather has been up and down too, yesterday it was windy and hot, today it's humid and cloudy...I mean, how is a girl supposed to know what to do with her hair with that! LOL! Love the hat, you look so comfy! I love me a good baseball hat! You always look so cute!! You are so lucky you have spring training so close! I don't follow baseball quite as closely since our team has been ... ehh ... struggling ... for years ... (Go Mariners! Lol) but would LOVE to do spring training one of these years. You look so cute! I use to love going to spring training games. Always fun. I love baseball. You look so cute girl!! I need tanks like that so I'm gonna have to check on that. I can't imagine how awkward I would be taking public pictures so you look awesome and natural :)! The sun is FINALLY out here! Love this outfit on you - I wish I was more comfortable wearing shorts, because I love them on other people, haha - I just hate my legs. Super cute, it's so hard to plan when the weather is up and down! Love what you chose, you both look great! How fun! Great way to spend the day- and you look cute in these shorts, lady! So cute! Loving this sporty casual look! That baseball cap is adorable! Love both of these outfits-- I need to find a good pair of jean shorts! 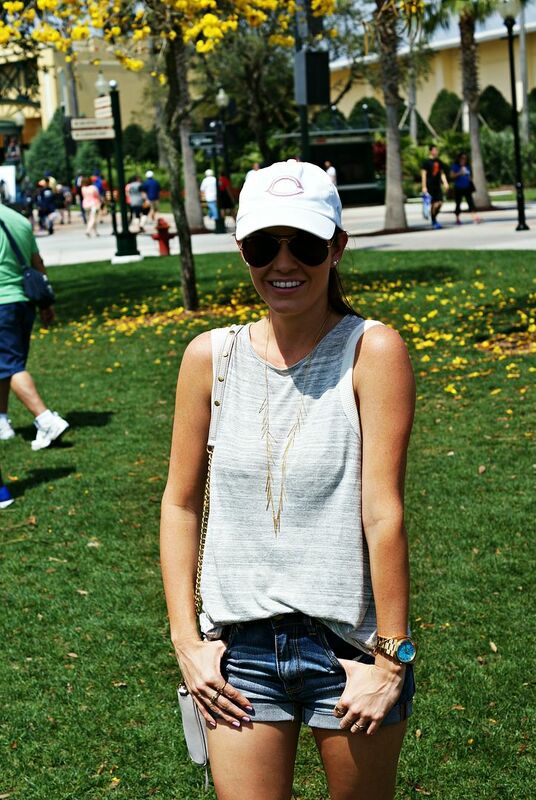 So cute and perfect for outdoor sporting events in Florida. You two are almost matching! who cares if it's a reds hat, it looks great haha. also, that tank is seriously adorable! You two make denim shorts and tank tops look good! 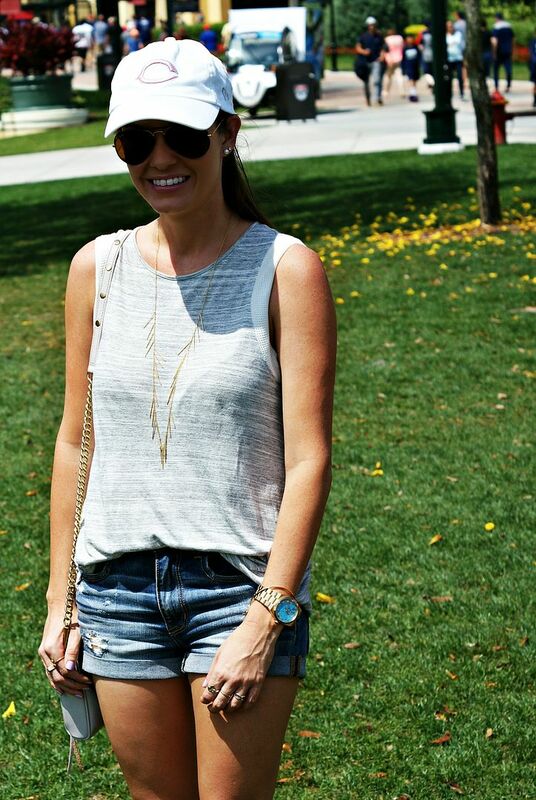 The perfect outfit for baseball! Such a perfect casual look! And looks like such a great time too! Super cute outfit! Perfect for a game! Y'all look so cute! Glad you had fun! 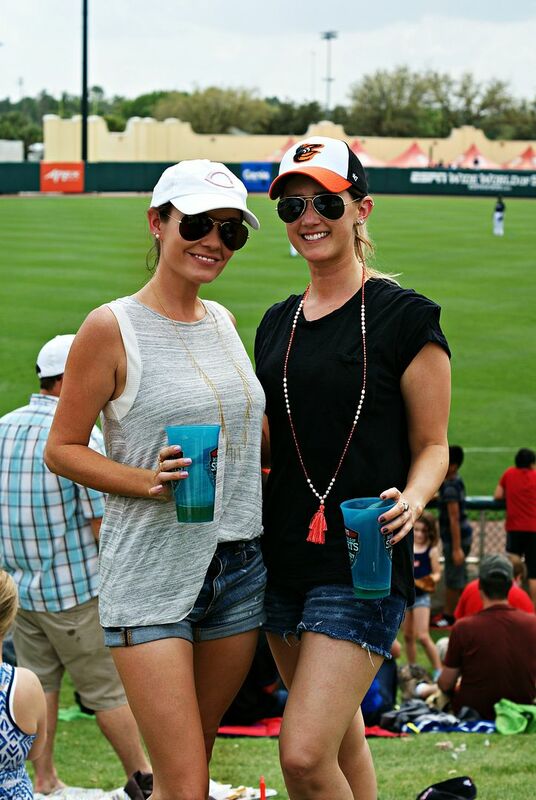 That's such a cute look for spring training! From what y'all were saying about how hot it was, it sounds like shorts and a tank were a perfect choice!